“Yes, indeed. It is a gem of a city!” After graciously thanking him, I went back to my coffee date with the crumpled Artvoice. As these words escaped my mouth, so did my North Buffalo pride. Obviously, this blog post is an effort to nurse my wounded Pride and to give all of us NoBu’s a glimpse of Hertel’s past. Stretching for four miles from Niagara Street to Main Street across North Buffalo, Hertel is named for John Stephen Hertel, former County Supervisor from the old twelfth ward. North Buffalo, and Hertel Avenue owed their habitation to the invention of automobiles around the 1900’s, becoming home to many Italian Immigrants who moved from the deteriorating lower west side of Buffalo (the Canal District), along with many Russian Jews, who relocated to Hertel Avenue from their original neighborhoods in the 1930’s. With the people, came their culture. Hertel Avenue became a hot spot for shopping, dining and entertainment. During the early 20th century, trolleys were a major source of transportation for Buffalonians- and these tracks crisscrossed Hertel. People came to shop and dine at places like Van Slyke’s Pharmacy and Klaiber’s Delicatessen. One of the most famous businesses that Hertel Avenue ever saw was “The Sample Dress Shop” opened by Anne Bunis at 1635 Hertel Avenue in 1928. The store catered to women’s clothing and other fashions, and saw tremendous success, thanks to its excellent marketing strategies which included dropping brochures from airplanes throughout the city, and their immensely popular Pup Sale, which was considered one of the most coveted sales event by Buffalo shoppers. While The Sample Dress Shop was definitely a feather in the crown of Hertel Avenue, North Park Theater was its crowning glory. Built in 1920, as a part of Shea’s chain of theaters, designed by architect Henry L. Spann, the building was adorned by a grand pipe-organ and Tiffany lights which have since been removed. 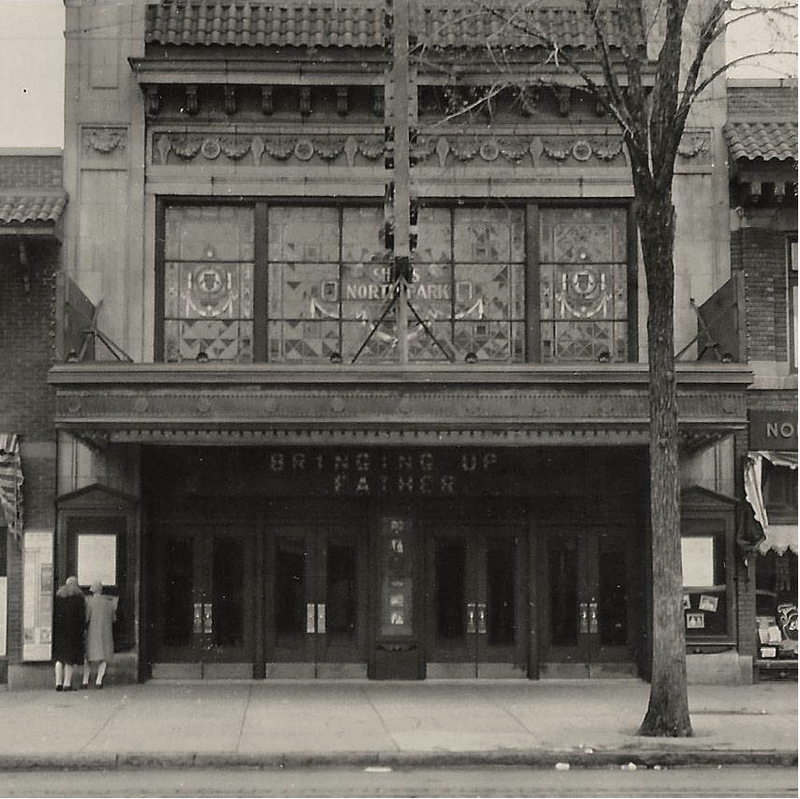 The theater’s ownership has passed from Shea’s to Dipson Theaters to its present owners, who recently restored the theater to its formal glory, and reopened the crown jewel of Hertel to its people. This blog post is first in the series of blog posts which aim to shine light on aspects of Hertel – which are unique to this neighborhood. Stay Tuned for more! This entry was posted in History & Culture and tagged Dipson, John Stephen Hertel, Klaiber's Delicatessen, Pup Sale, Sample Dress Shop, Shea's North Park Theatre, Van Slyke's Pharmacy by Meg Vaidya. Bookmark the permalink. Growing up in North Park in the 70’s and 80’s, I get “homesick” looking at these photos.